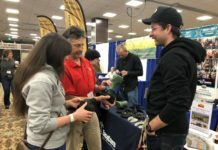 This last year has been a huge year for me in natural horse care and natural hoof trimming. While I have trimmed my horses for the past several years, I haven’t had to deal with anything abnormal. My horses had nice feet, were sound and didn’t show any signs of sugar/starch sensitivities. I think last year the barefoot Gods decided to lay it on me. 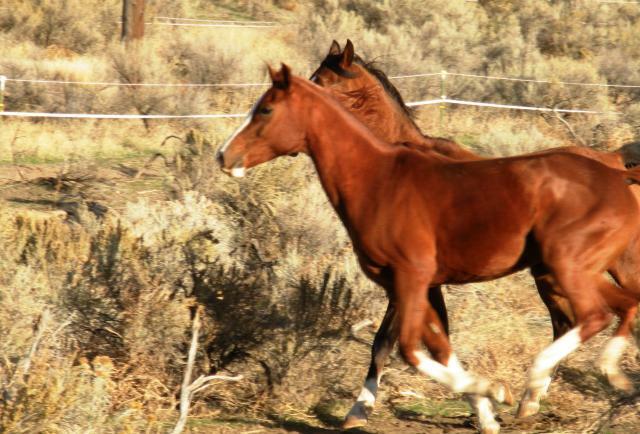 More on that later, in this post I want to show some pictures I took of the “then and now” pertaining to my mare. This is Belesema Replika. She was new to me as of last September. 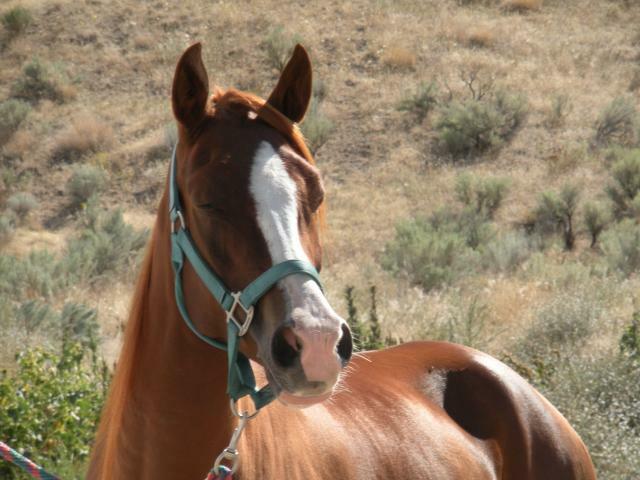 I adore this mare. I wish I had pictures of her feet prior to ripping off, er pulling her shoes, but considering we took them off the second she was placed into my hands, I didn’t have time to take pictures. Replika had been pulling front shoes for the past year. 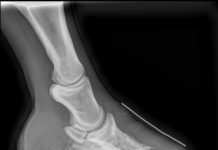 The farrier had attempted to stack up her heels in the hinds and completely dubbed off her rear toes to prevent this. I know he was only trying to help, but he either forgot or didn’t know enough to address her front feet. She had several new and old marks on her heels from forging. Her toes were long. Her heels contracted. Her soles were flat. Oh man….. She was sore barefoot on all ground, so we immediately fitted her to glue-ons and packed those babies with Goober Glue. I kept boots on her for 7 days at a time, letting her feet breathe for a day or two before re-gluing the boots. Within three weeks she was sound barefoot in the pasture. 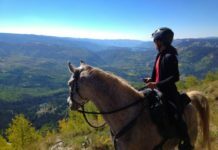 This mare went on to complete four days at a five-day ride in October, one month after transitioning to barefoot. We took it super slow and rode our own ride everyday. She continued to amaze me, day after day. I pretty much left her alone the rest of the winter, putting her on a high-fat, low sugar/starch concentrate, Platinum Performance and Platinum Hoof Support. I kept up on her feet, increasing the breakover and working on her medial-lateral balance. Imagine my surprise this spring when I took the following pictures… (Before on the left, after on right). Check out that concavity! Her foot was so flat last September. Despite the left-over glue on the “before” foot, you can see the flare and long toe. 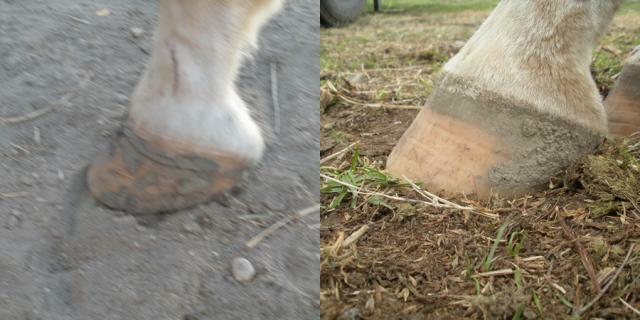 The “after” shot shows a great hoof-pastern axis. Her heels are of a good height and the flaring is gone! This is my favorite shot. Look at that difference! Her feet gained a size in the Easyboot Gloves! I have been riding Replika for the past few weeks completely barefoot. I started cautiously at first, only taking her on the best footing. Every week she got stronger and stronger, and faster and faster! She flew over hard-pack dirt road with gravel the other day, I couldn’t have been more excited! It’s still a road, but I couldn’t be any happier with the progress this mare’s feet have made in the six months. I CANNOT wait to see how they look in another six months!